Be the first to share your favorite memory, photo or story of Noel . This memorial page is dedicated for family, friends and future generations to celebrate the life of their loved one. Noel Edward “Ed” Nelson passed away January 23, 2019 at Sea View Senior Living in Brookings, Oregon. He was born in Seattle, Washington to Elmore and Katherine (Wider) Nelson on December 19, 1938. Ed graduated from Cap High School in 1956 and enlisted in the Navy that same year for a 3-year term. He earned both a bachelor’s degree and master’s degree at the University of Montana, graduating in 1962. He worked as a Probation Officer for Sacramento County, California, and his last position was supervising other deputy probation officers. Prior to moving to Brookings in 2001, Ed and his wife traveled for 14 years on a 54’ trawler, going to British Columbia, Mexico, Guatemala, El Salvador, Nicaragua, Costa Rica, Panama, Honduras, Belize, Cartagena, South America, Cuba, Florida, Virginia, Washington DC, New York and Connecticut. He enjoyed water skiing, camping and golf. 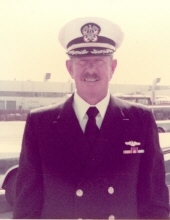 Ed was very proud of his services in the Navy, having served in active duty from 1956 to 1959, and as a member of the Naval Reserve until October 1989. Ed is survived by his wife, Beverly Nelson, daughters: Sara and Joanna Nelson and son in law, Matt; grandchildren: Nelson, Gabe and Reed; Stepdaughter Debbie Schatz and stepson Chris Britton; Step grandchildren: Melissa, Andrea, Ashley, Mason and Carl. Step great-grandchildren: Nathaniel, Noah and Emilio. At Ed’s request, no services will be held. Donations in Ed’s name may be made to the South Coast Humane Society. Redwood Memorial Chapel is assisting the family. To send flowers or a remembrance gift to the family of Noel Edward "Ed" Nelson, please visit our Tribute Store. "Email Address" would like to share the life celebration of Noel Edward "Ed" Nelson. Click on the "link" to go to share a favorite memory or leave a condolence message for the family.